I love music! And I love books. I have seen someone match their photos with family and friends with songs (Hi Belinda!). I thought it would be interesting to apply the same to books. So without further ado, in no particular order, here are a couple of songs and books I think go together. If you have read this book and listened to this song I think the connection speaks for itself. First off, the drama. Naija sponsored! The character development in both is brilliant. Each of Baba Segi’s wives had my heart for different reasons, and when watching the Johnny video you cannot help but root for Yemi! I really wanted her to find and beat Johnny. Still on character development, the host of the TV show, ‘We Don Catcham’ in the Johnny video was amazing. This man needs a segment in real life! Another connector between the two is they are both about this one man whom all these women’s lives revolve around. Baba Segi and Iya Segi, Iya Femi, Iya Tope and Bolanle and then Johnny and Yemi, Cynthia, Uche, Nene and God knows how many others. All these women’s lives are turned upside down because of this man and yet despite all the trouble, they stay roped in. In Yemi’s song, Johnny stays ‘her Johnny’ even after she lists all his sins! Anyway, Baba Segi is forced to deal with his secret in the end and Johnny is served mob justice so…we’re okay. Baba Segi’s Wives is actually one of my favourite books by a woman. Check out why, here. This is one of my favourite books of all time. Set in World War II, it tells the story of an orphan girl taken in by a German couple after she loses her mother and younger brother. She falls in love with reading at a time when it is very dangerous to. Her foster father encourages her passion and she continues to grow in her love and knowledge of written word and it carries a firm message of love and hope throughout the book. The song that I think goes perfectly with this book, is Seasons of Love from Rent the movie. The question in the song is how do you measure the life of a man? And I think one of easiest and most beautiful ways to do that is through the written word. Through stories. If you tell your story on a page, it lives on so much longer than you do. This was the first Marian Keyes novel I ever read. I remember I picked it up before a long plane ride back home and I had random strangers really concerned because I kept laughing out loud. It was one of the funniest books I had ever read. I read about six more of her titles right after. This one is about Anna and her wacky family in Ireland, but more importantly, the life that she has built for herself back in New York. She heads back and finds that things aren’t quite as she left them and as she comes to terms with some truths, we are taken along for the ride. The perfect song for this one is a new fave by a fave of mine, Work Out. It’s perfect because in it Chance The Rapper, talks about different not-so-perfect situations that end up ‘working out’. And that is what most Marian Keyes novels are about. Messy women living messy lives with everything working out in the end. Also, both are just really feel-good. They are what I always want to use to describe my mood. Books about mother-daughter relationships are up there for me. I read them with my heart full of so many emotions, and Patchwork was no exception. We review the book over on our #MEiREAD channel here, so I won’t get too much into it, but to summarise, it is about the life of Pumpkin, a little girl in Zambia born to the alcoholic mistress of the affluent businessman Joseph Savavungo. We see the effect of blended families on all concerned in every aspect. This book is a reminder that happily ever after is a thing of fairy tales. In real life, even if things start off beautifully, there are always curves in the road. Which is the story in Fast Car by Tracy Chapman. Here is a girl convinced that she has found forever with this guy but that changes quickly after they run away together and start a family, and when it does she is ready to get into the next fast car and drive off. Pumpkin, as she grows older, is also quick to do that. She is engaged three different times before she marries her husband Tembo. A beautiful book if there was one. This is a memoir, documenting the life of a young girl and her family during the time of Idi Amin. Unlike many books of that time, this one highlights life being lived with war as the backdrop. 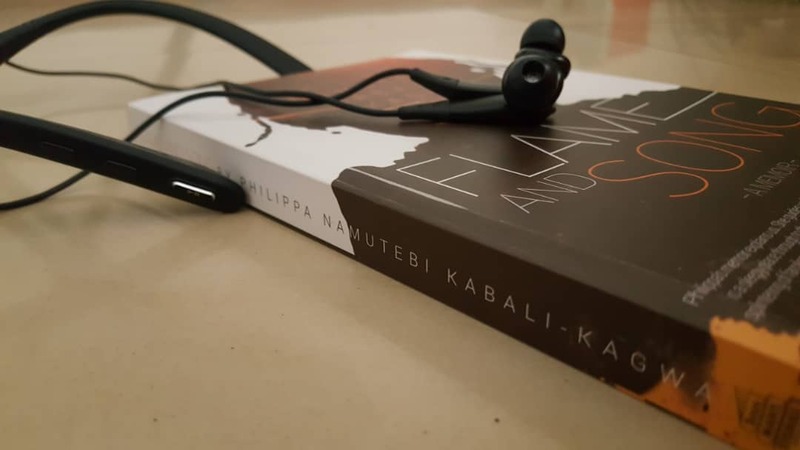 As Philippa narrates stories of first days at school and living-room concerts with her cousins, the whispers of ‘Bamutute’ and the hurried manner in which many characters leave, you are reminded that this was in fact war. Philippa’s solace throughout the book though was music. She sang all through her childhood joining the school choir in all the high schools she joined. Philippa still loves music. And a good thing too, because Chance said it right – music is all we got! All we got is also a bit of a story that like Flame and Song describes growth and change all while hoping and finding that hope in music. What are your thoughts? Am I way off? What song matches a book you know?